At the Keeler Centre in Colborne, Ontario on January 13th in a physical affair, the third place Niagara Whalers faced the fifth place Northumberland Stars in a south division Greater Metro Hockey League match – up. Only 1:05 into the opening period, Niagara’s Frolov Mikhail sinks the first goal for the Whalers to give the visitors a 1 – 0 lead with Kellan Rosenbaum and David Christopher adding the contributors on Mikhail’s goal. Christopher finds the back of Northumberland’s net for Niagara’s second of the game 16 seconds after the Whalers first with Rosenbaum and Mikhail setting up the goal at the 1:21 mark of the period. Devin Laird pulls the Stars within one with a goal behind Niagara goaltender Will Harvey’s net 4:17 into the first with Tyler Brackin and Tyler McGregor notching the assists. Giving the Whalers a 3 – 1 lead, Rosenbaum fires an unassisted goal into the back of Northumberland’s net at 13:08 of the first period. Doug Andrew pulls the hosts within one 8:55 into the second with Andrew Pankhurst and McGregor registering the helpers on Andrew’s power play goal. With 30 seconds left in the period, Bo Stevenson sends the Stars into the second intermission even at 3 – 3 for Northumberland. Pankhurst and McGregor had the contributors on Stevenson’s tying goal. 21 year old Brandon Lindberg scores the go – ahead goal for Niagara 51 seconds into the final period with Elias Berglund and Christopher adding the helpers on Lindberg’s power play goal. 27 seconds past the halfway mark of the third, Lindberg finds the back of the Stars net for his second power play marker of the game with Ethan Spaxman and Christopher setting up the Whalers fifth of the game. With their third power play goal of the period, Jesse Masterson and Mikhail added the contributors on Rosenbaum’s goal to increase the lead to 6 – 3 at 16:34 of the period. With 1:56 left in the game, Andrews sinks the final goal of the game with Stars Stevenson and McGregor drawing the helpers on Andrews’ power play goal. Niagara goaltender Will Harvey turned away 53 of 57 shots in the Whalers 6 – 4 win. 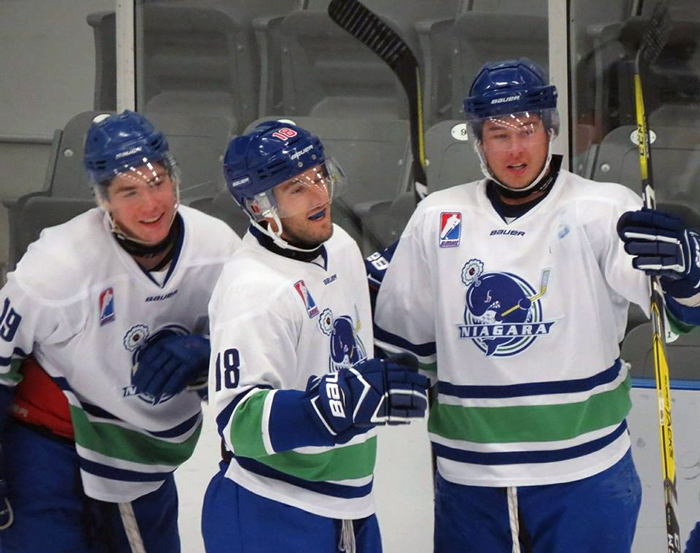 The third place Whalers will now host the first place St. George Ravens in a south division match – up on January 19th at the Vale Centre in Port Colborne in a 7:30 p.m start.